However, it is also smart to sometimes do the unexpected because it will catch them off guard, get you an easy point and keep them guessing for points to come. In today’s video, we’re going to be talking about the drop off of a drive. 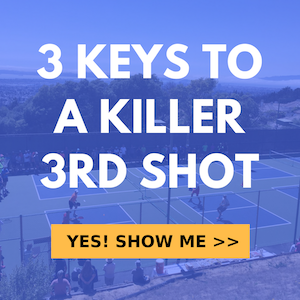 Jordan and I teach this also that typically when they’re – when you’re up at the non-volley zone line and you’re getting the ball – you’re receiving a drive, you’re going to want to keep that person back. You’re going to want to hit firm volleys back deep. But in this particular instance, you’re going to want to hit a drop in certain instances like this one where let’s assume that Jordan, I pushed him or me or my teammate, we pushed him way deep or way off to the side and he’s just in a really bad position and he’s expecting that we’re going to run him again on that next one. OK? So you really want to set it up, so that you have them thinking that you’re going to drive that ball deep again and – but instead of that, what we’re going to do is we’re going to hit a drop shot and very often, that ends up being a clean winner because they’re so committed already to having to chase a difficult ball down either left, right or back that all their momentum is leaning to that side or back. They’re really bracing themselves for an attack, not to have to do a full-on dead sprint forward. OK? So this is specifically what you’re going to do in that instance where you feel that they are 100 percent expecting you to hit it deep, hard again. You’re going to want to trick them and drop it short when they least expect it. OK? So how we’re going to execute that, we will talk about it right now just on the forehand side. If Jordan rips it at me, I’m going to basically stick my paddle out, try to get a little lower. I can’t right now because of a back problem. But really the important part is to put that racquet out and just kind of receive it a little. You receive the ball and you want to absorb some pace off of it. So that it just drops over the net. OK? So really very – it takes a lot of touch and it’s a very subtle move. There’s really not a lot going on. You have to feel it and just somewhat move forward but with your body. But then you’re kind of retracting your paddle back as you move to it. All right? So here we go. Jordan is going to rip some at my forehand. OK? So you really want to try to land that as short in the kitchen as possible. You’re going to have to have some arc on it and a little bit of backspin to keep that ball low. All right. OK. So that’s how we do a drop off the drive and you want to use it again when they’re not expecting that and they have all their weight committed to be going in a different direction. When you are sure that they are expecting yet another driving shot that will keep them back then it’s a good idea to mix in the drop volley. Often, it will be a clean winner. The last thing they will expect when bracing themselves for an attack is to have to do a full sprint forward.